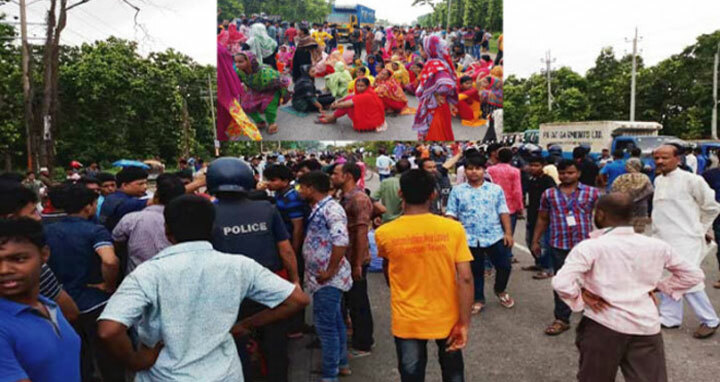 Gazipur, 17 August, Abnews: Workers of a garment factory blocked Dhaka-Mymensingh highway in Hotapara area on Friday morning demanding arrears and Eid bonus. The agitated workers of Elegance Garments took position on the highway around 10 am on Friday, demanding half salaries for the month of August before the Eid-ul-Azha vacation. Without paying their salary and Eid bonus, the factory owner hanged a vacation notice on the gate, they said. Seeing the notice took to the streets, blocked the highway and vandalised several vehicles. Due to the demonstration, hundreds of vehicles carrying the Eid-ul-Azha holidaymakers remained stranded on both sides of the road due to the blockade.